Prominent is showing its products at the Pumps & Valves trade fair in Dortmund (Germany). This includes the CANopen-connectable solenoid metering pumps. Prominent presents its metering technology at the Pumps & Valves 2019 on February 20 and 21. The company is presenting solutions for digital fluid management. Highlights of the Heidelberg-based manufacturer’s stand will be motor-driven and solenoid metering pumps as well as peristaltic pumps. 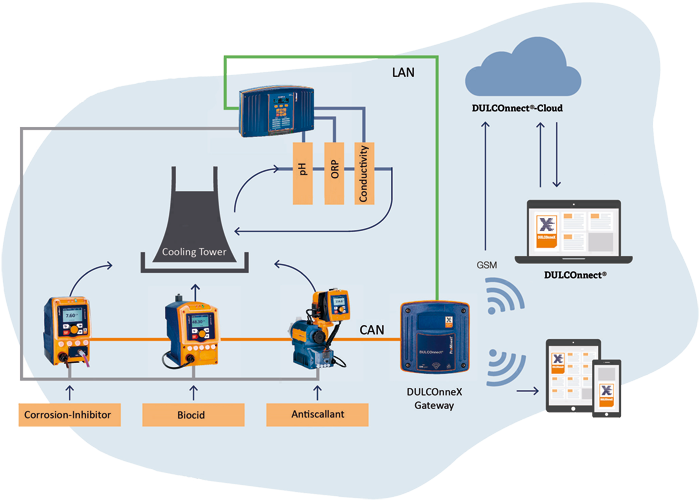 The shown products are linked to the web-based fluid management platform via the Dulconnex gateway. For digital fluid management, the gamma/XL metering pump, the Sigma X motor-driven metering pump, and the DFBa peristaltic pump are suitably. The devices are optionally equipped with CANopen interfaces. This allows the operator to monitor, analyze, and optimize metering processes. Operating mistakes and downtimes are avoided. The consumption of the raw materials used is minimized. For more than 55 years, the Prominent Group has been a manufacturer of devices and systems in the field of fluid metering as well as for water treatment. The group has about 2500 employees in 51 own sales, production, and service companies. The products are available in about 100 countries. In addition to the treatment of public drinking and wastewater, the key sectors include chemical industry, industrial water treatment, food and beverage industry, treatment of swimming pool water, oil and gas industry, and process industry. In order to be a dependable long-term partner for its customers, the group is investing both in product innovation and in state-of-the-art manufacturing. Prominent operates 11 production facilities worldwide.